Watch tractor videos for kids who just love them, and what better way to view them from our top 10 list; with John Deere, Claas, Ford, New Holland and Massey available. These kids tractor videos are mostly made up of tractors just doing their thing. This includes riding around the yard, ploughing the fields, spreading muck and generally just pulling heavy machinery by tow. Well these are not our videos, we've created a playlist below from YouTube with videos we consider the most entertaining for kids. This videos shows a multitude of tractors and machinery on display well competing in a maize silage race. Produced in German, but the language barrier isn't needed as it's just music (be warned it's loud) and machinery footage. Plenty of scenes whereby the tractor and trailers are riding side by side next to a forager well harvesting maize. When the tractor drives away its because the Krone trailer is full and needs emptying. Fun video with educational aspect, watch as a range of model tractors use various equipment to bale the field. First up is the blue Landini with Wegler, well baler releases bales the vintage Massey Ferguson wraps the bales in black film. A short film showing the whole process of baling green silage bales before extracting the compact grass, before the wrapper machine covers them tightly in back wrap – to dry them out so the cows can feed in the harsh winter. 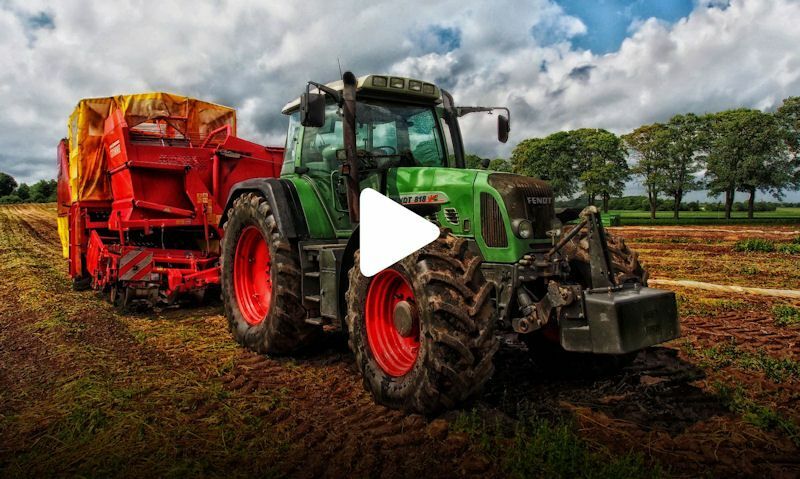 Watch as a Claas tractor struggles to manoeuvre in a muddy field as it prepares to harvest in muddy conditions. Its made harder when the tractor has to ride side by side with a Claas forager to collect the maize in the trailer. Then a New Holland tractor takes over the duties pulling along the trailer before finally a Fendt comes in. This is all back and forth work as the tractors need to empty the trailer and the others take over to get the job done ASAP. Enjoy a New Holland and McCormick firstly going through the tedding grass, well two tractors work side by side to rake the grass. This is the part the hose is spraying the glass into the silage trailer being pulled by the blue New Holland. You probably won't want to be their as much as us, but watch as a JCB telehandler scoops cow muck from the sewer, then piling it into an awaiting muck spreader being towed by a Massey Ferguson. He's then off to the fields to fertilise the crops. In this kids friendly tractor video, watch as a red vintage Kubota tractor does it all; from the beginning ploughing the field for planting seeds. Meanwhile, in the next field the hay needs cutting, before getting the baler out and making rounded bales, then collecting and wrapping it up after it's dried out in the sun. Well all the tractors assemble on the field, the vintage Ford arrives with the wrapper, well the John Derek will do the tedding on the grassy field. But not before the McCormick awaits to pick it all up with the matching red baler. At the end, the vintage Ford tractor will wrap up all the bales, but we don't get to see that. You'll also notice the John Deere tractor has a bale fork attachment to pile bales on trailer. These two mighty red Massey Ferguson have some work to do, well pulling a long a Krone Big Baler. With a large field to cover, the tractors are creating big square silage bales well you can watch them being ejected from the back of the machine. Later, they get out the wrapping machine to cover the bales in black wrap. In this video, watch as a New Holland tractor rides sides by the side of a huge tomato harvester that collects the fruit, well working on the machine as it moves. Then the tomato's are taken away to be washed well still in the trailer. In the second part, see how harvesting tomatoes in much less industrial process using smaller, but interesting farming machines. Finally, just sit back and enjoy a whole bunch of tractors and implements working together to harvest silage off this big field. Featured is a John Deere, New Holland and Massey Ferguson tractor working with a Claas forager piling in the silage into the trailers.